My colleague Dave Casey designed the initial lesson. I enjoy this modeling activity. It’s based on developing a relationship between the width and height of a car jack – which just happens to be a perfect shape to be modeled by a rhombus. I bring a car jack, but also like to show these videos because the jack opens a little slow for the students to get a great feel of the movement. Is it more difficult to raise the car in the beginning or the end? Let’s say 16 of us each signed up to move the jack screw 1″. Would you rather be the 1st person, the last person, or does it not matter? Here is an activity handout you can use. I didn’t use it – but it was nice to have for students who were absent that day. I start by talking about the shape. 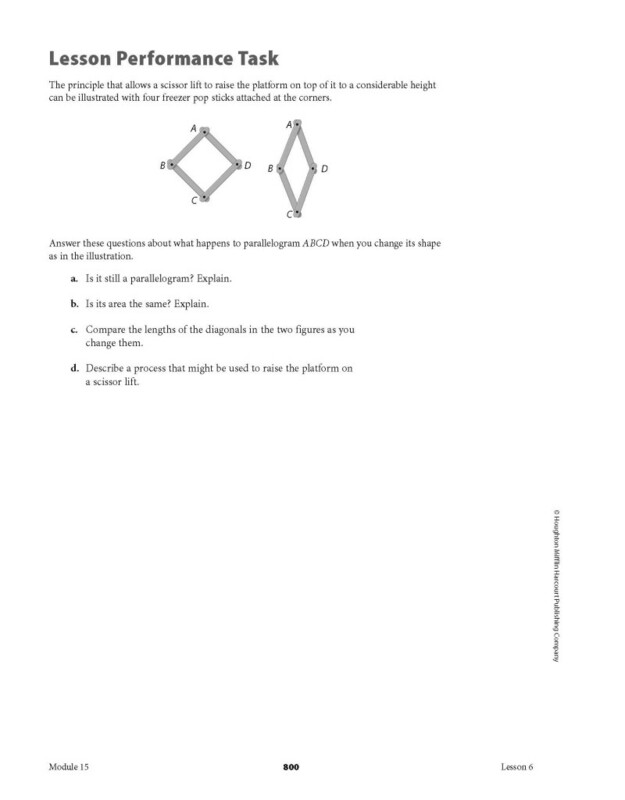 I have the students draw the shape and we make conjectures about the key characteristics of the shape. 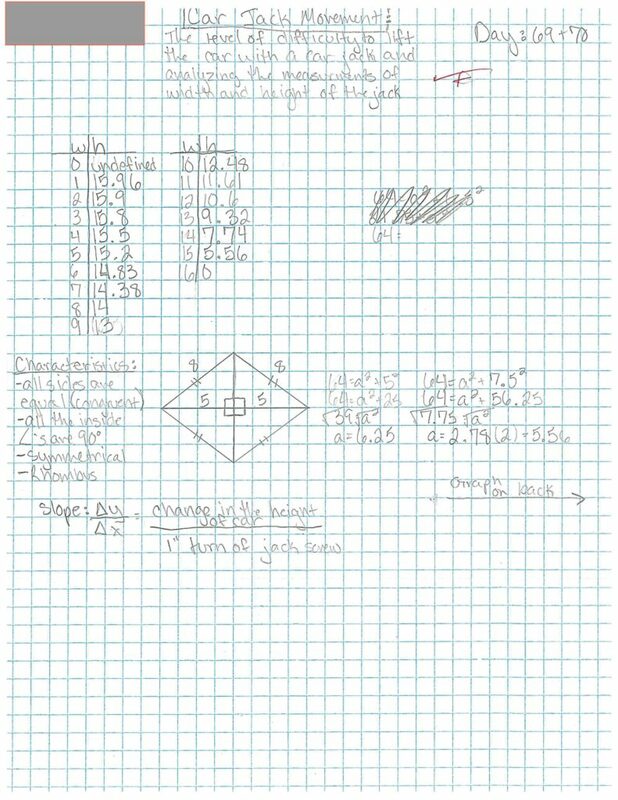 The students have graph paper, so I recommend a uniform figure – I tell them to make it eight gridlines long, and +/- two gridlines up and down. A critical point here is let the students know that the car jack is actually not a rhombus because the sides don’t actually touch. So we are modeling the real car jack as a rhombus even though that is not actually the shape. The rhombus is a mathematical model of an actual car jack. Even the word “modeling” itself implies that we are not working with the real thing – rather a model of the real thing. 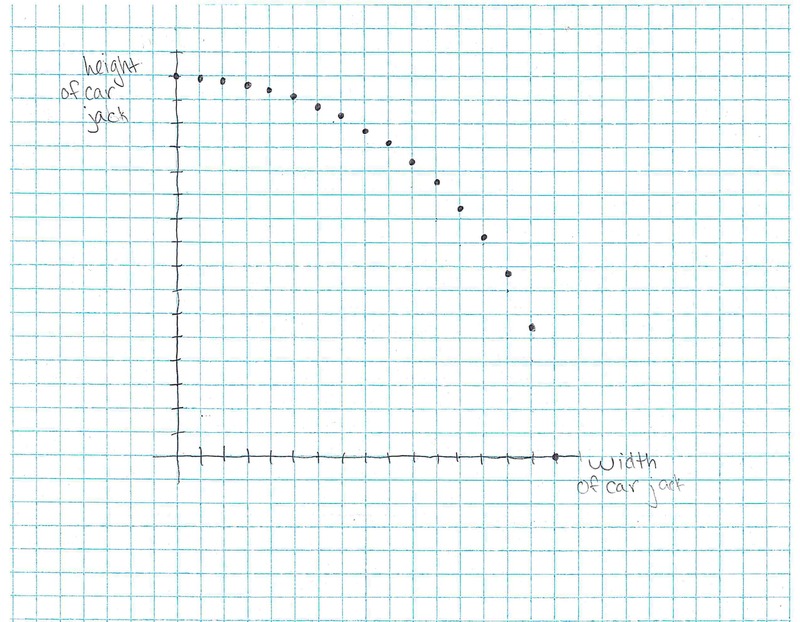 What is the largest width we need to consider? What is the shortest width we need to consider? I then put them at whiteboards and tell them the whiteboard number they are at is the width of the car jack they need to calculate the height for. I also tell them to pick one other width. I do not tell them how to do it – just what to do. 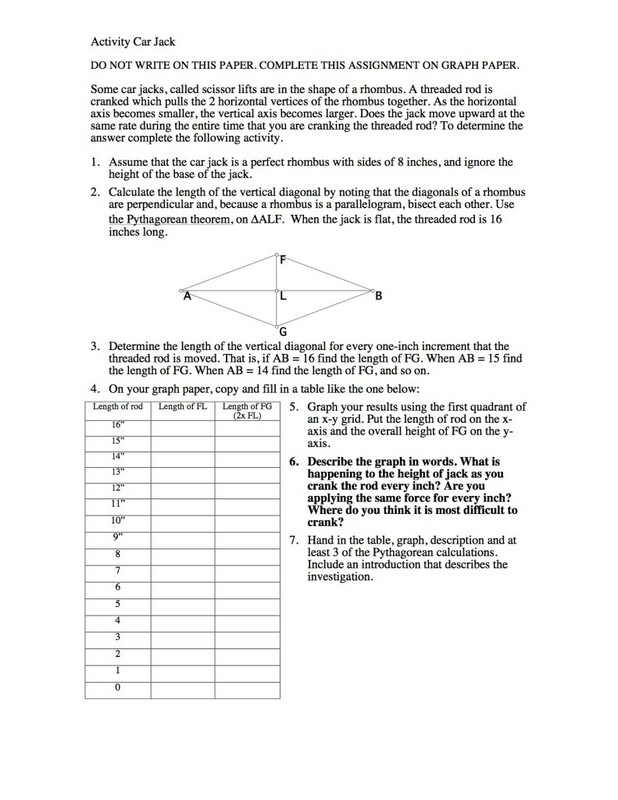 I’ve done this with classes that knew the pythagorean theorem and used it, and I’ve done it with classes that didn’t and we used this a vehicle to reteach the pythagorean theorem. Common Mistake Alert: A few students will anticipate a linear relationship and just quickly make a table that goes 16-0, 15-1, 14-2 etc. Once they have the table, I have them graph it. 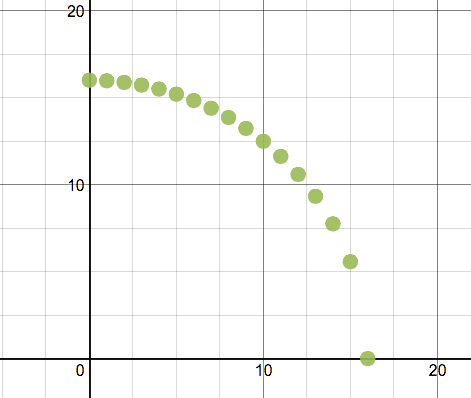 I show the Desmos graph, talk about how to write the function. Once the talking circle is over I am generally satisfied that they have all had sufficient opportunity to think and discuss. I go around the room again and tally the results of the talking point and have a group discussion, calling on various students to give their reasoning. My goal by the end is to get the students to see that the car moves more in the beginning than in the end, and understand how that validates arguments for the beginning or end being more difficult based on how the word “difficult” has been defined. Here is a students work – but a lot of the great student thinking that happened here today was not caught on paper. I didn’t take any pictures of the whiteboards. Regrets: I never had them write their arguments for when they thought it was the most difficult to use the Car Jack. At least not formally. I need to do a better job with the written communication piece of modeling.